As our phones are becoming an increasingly integral part of many things that we do, they are an ideal target for cyber criminals. 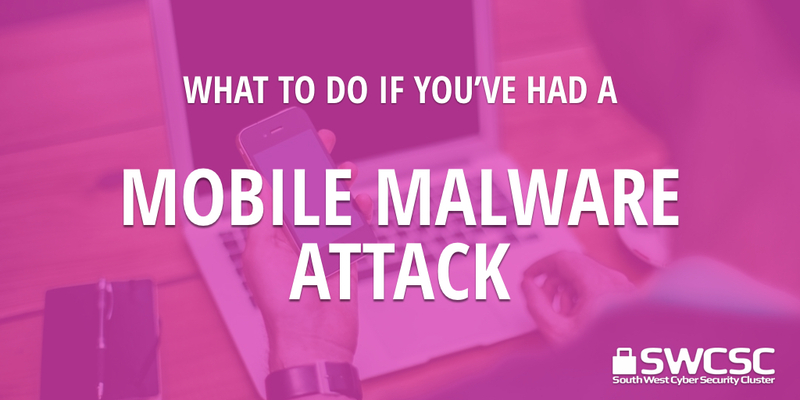 They will aim to introduce malicious software on to your phone. It could be designed to steal banking information, make app purchases you did not make, send premium SMS/text messages, connect to external sources etc. Sluggish performance/freezing, suggesting that malware is using up your phones resources. If any of the above happens on your iPhone then first try a reboot by holding the power and the home button until it reboots with the Apple logo. Android phones try booting in Safe Mode to trouble shoot any apps that should not be there. Normally you can do this by pressing and holding your phone’s power button for a few seconds until Android prompts you to turn off your phone. Then tap and hold Power off for a few seconds until your phone asks you to confirm that you want to enter safe mode. This will allow you to start your device with the original software and apps which came with your phone. Only download apps from trusted developers on official app marketplaces like Google’s Play Store and Apple’s App Store, not third-party websites. Read reviews on official marketplaces on each app before you download as this provides a useful vetting system for their apps. You will normally be able to discover if the app asks for excessive permissions or another user may have written about malicious activity. Install a mobile anti-virus solution onto your Android or iPhone device. Regularly run update device and ensure they are from a trusted source, not a link.